Continuous Integration can also be extended to automate other common activities, such as deployment and monitoring. The result is a much faster turn around time from design to deployment, with the added ability to keep an automated eye on the current state of things. The constant integration and error checking helps create a more stable product and provides a consistent window into the state of the current system, while the automation provides the ability to perform complex operations either automatically or at the press of a button. How does one configure continuous integration in an existing development infrastructure? Where do you start, and what tools and technologies do you need? Before you start having to worry about tools and technologies you first need to consider what type of an environment you have, and what type of an environment you need. If any of these items are missing you are going to need to get them in place to be able to do any type of continuous integration, and to effectively version and test your system. Development - This refers to each individual developer's machine, which must consist of the appropriate Integrated Development Environment (IDE) and must be able to run the system. Ideally the system should also be runnable out of the IDE, which is a big time saver. Configuration Management - The refers to the software configuration management server that is responsible for tracking and controlling code changes. SCM concerns itself with answering the question "Somebody did something, how can one reproduce it?" Quality Assurance - Refers to the server which is at a team accessible location where the more recent version of the system has been deployed. This is a good target for an automated deployment, since the purpose of this environment is to be the more recent version. This is also a good place to run integration and acceptance tests, to ensure system integrity in an automated fashion. Staging - Refers to the server which is at a team accessible location, and that is as close to production as possible. The purpose of this environment is to serve as a non-customer facing production clone which can be used for manual testing, and serves as a verification that the system here is ready to be deployed to production. Production - Refers to the location to which your system is deployed, and which customers currently use. Defect Tracking - Refers to any system which you use to track defects, feature requests, and any other tasks related to making changes on a system. It answers the questions "what is wrong, what needs to change, and who is working on what?" Assuming a three tier architecture with a separate client, server, and database there are three aspects to an automated build. 1. The Client Build - Must be able to compile, run unit tests, and package the client portion of the system for deployment. 3. The Database Build - Generally part of the server build, must provide the ability to create a database from scratch, apply updates, export the data from the database, and refresh the data in the database from an export. 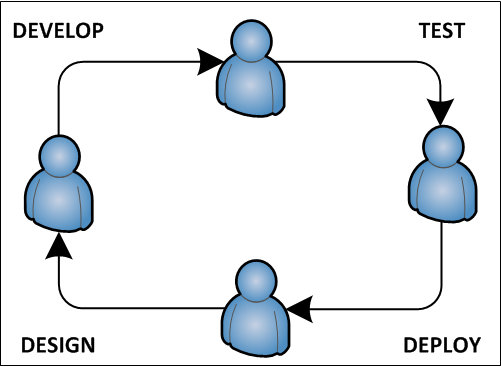 From a process perspective the client and server can be deployed independently, but the server deployment is tied to the database. This is because server projects contain entity mappings to the database, which generally ties the two together together. From a production management perspective changes to the database have to be tightly controlled. You just can't drop and create the database every time you need to make a change, because that would obviously delete new data that had been created as the result of end users working on your system. There needs to be some mechanism for applying an update to the database, which manipulates the exiting data and structure while leaving the database intact. From a developer setup perspective, developers that come on later in the project need to be able to re-create the database in the same state that exists in production, or on which the other developers are currently working. This requires that you track the updates that are made to the database. From a testing and maintenance perspective, the ability to save off a state of the database and later restore it is required in order to run true acceptance tests. For example if your automated acceptance test includes creating a new user named Bob you can only do that once. Refreshing the database allows you to continually run acceptance tests and then return the state of the database to what it was previously, so that you don't have to create smarter scripts that use different usernames and such every time they run. This also allows developers to import the states of databases used by QA in order to more easily reproduce problems related to data. These needs result in a build that provides the ability to create a database from scratch, by which the initial database is created and then all updates since its creation are then applied, and also allows the saving and refreshing of data. 5. Integration Testing - The scenario for running integration tests for the system. Integration tests are tests that verify the behavior of server to database operations, along with any other integration points. There are also tools and techniques for running integration tests against an undeployed system and reverting the database on a test by test basis. 6. Acceptance Testing - The scenario for deploying the system and running acceptance tests against it. Acceptance tests are tests that drive the graphical user interface using pre-recorded actions in order test overall system functionality, such as logging in, creating an account, and so on. 3. Integration Testing: On the pass of either the client and/or server build, the CI server runs the integration testing scenario. This is a task where you want to maintain a lock, as you do not want multiples of this task or any other related downstream task running after this part of the process has started. 4. Acceptance Testing: On the pass of integration testing, the acceptance testing scenario now runs. This is another task that needs to maintain the same lock. 5. 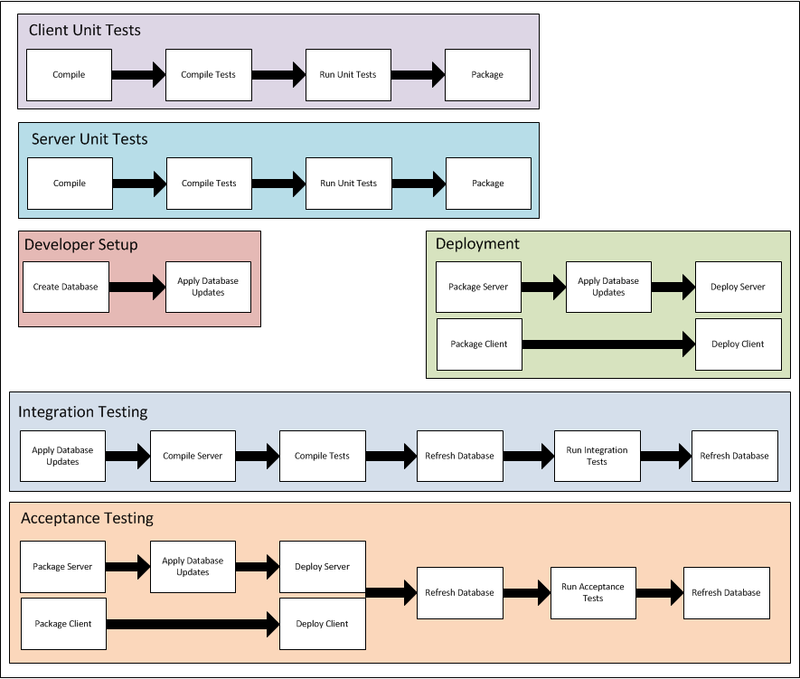 Staging Deployment: On the pass of acceptance tests, the CI server deploys the system to the Staging environment. This is another task that needs to maintain the same lock. 6. 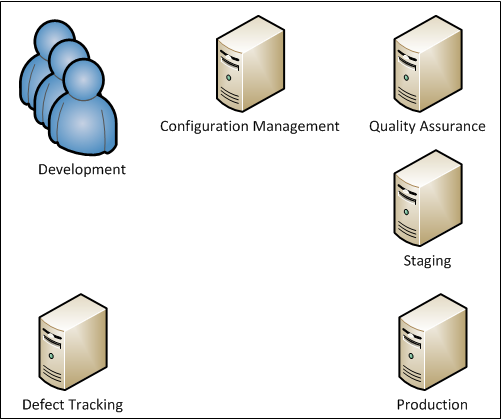 Production Deployment: On manual acceptance of the state of the system in the Staging environment the system is ready to be deployed to production. The process described was primarily accomplished using a combination of the Jenkins/Hudson CI server and the AF Ant Framework, which contains complex macros for compiling, testing, packaging, deploying, and database management through Ant in various technologies. Ready to make CI work for you?